BEECH GROVE—When Benedictine Sister Jennifer Mechtild-Horner thinks about the Rule of St. Benedict, she says mercy is one of the words that comes to mind. So how does the Holy Year of Mercy play out in a community that already lives by mercy as a rule? The Criterion spoke with members of the Benedictine community to discover how they have highlighted in a special way this year that trait that is so paramount to their vocation, and the different ways in which mercy is shown in the daily work of the sisters. 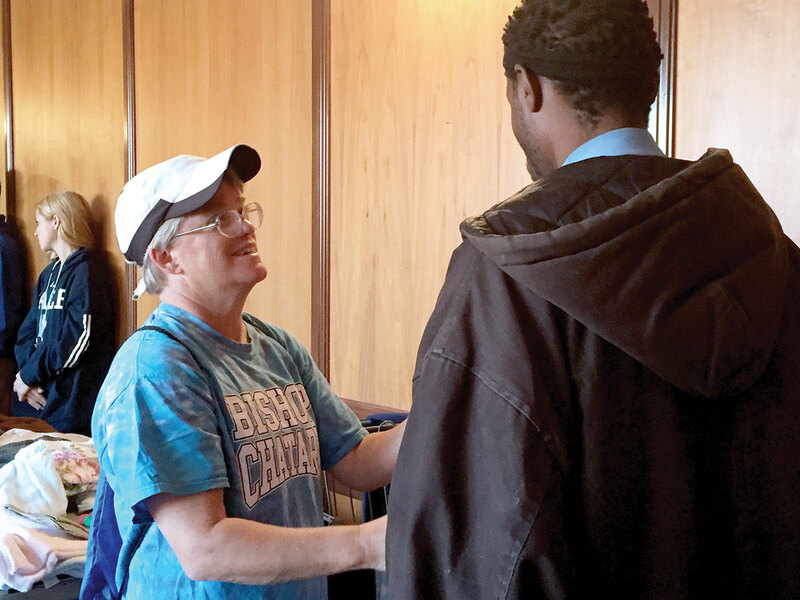 Being a community based on mercy, the sisters “did not suddenly start being merciful on the first day of the jubilee year,” says Benedictine Sister Mary Luke Jones, monastery director of development, with a chuckle. She lists special actions the community took to mark the jubilee year, such as having mercy-themed prayer services for the public (with the final one set for 4:15 p.m. in the monastery chapel on Nov.6). The efforts also include sharing quotes about mercy in donor “thank you” letters, offering a retreat on mercy at the Benedict Inn Retreat & Conference Center, and publishing an educational article about corporal and spiritual works of mercy in the community’s newsletter. Internal actions were taken as well, such as trips for the sisters to walk through the Holy Doors of Mercy at SS. Peter and Paul Cathedral in Indianapolis, and Lenten reflections on Pope Francis’ letter announcing the holy year, “Misericordiae Vultus” (“The Face of Mercy”). Both sisters agree that much of mercy is seeing Christ in others, an action that lies at the center of the Rule of St. Benedict. Benedictine Sister Kathleen Yeadon, a 53-year-old teacher of theology at Bishop Chatard High School in Indianapolis, defines mercy as compassion. “It’s how you receive others, how you understand their own struggles,” she says. Mercy was infused at an early age in Sister Kathleen, whose 17-member family operated a food pantry out of their basement for St. Joan of Arc Parish in Indianapolis. And give it back she does, in many ways. While Sister Kathleen’s list of merciful activities includes volunteering for charitable organizations such as the Cathedral Kitchen in Indianapolis—where she takes the students of her social justice class to volunteer twice a year giving out clothes they collect—and bringing food to Help Our Own People, much of her mercy is given out on the fly. It’s not just in the giving of needed goods, but in the interaction with those she encounters that Sister Kathleen finds the most mercy. “I develop these friendships,” she says. “I feel God leads me to these people. There are a lot of cool things that happen when you interact with people not in your economic status. Most people I’ve met have been so kind to me. They remind you your life is not as bad as you think. Sister Kathleen looks to the current pope as a model of mercy. “I think it’s great that Pope Francis teaches [mercy] all the time,” she says. “He’s everywhere doing everything. “I love how he’s met with the different groups [each month during the Year of Mercy], so each time is a different group we’re supposed to reflect on, and we’re called to keep thinking about it. Benedictine Sister Heather Jean Foltz, 33, sees her vocation as a journey of unfolding mercy. After entering the monastery in 2009, Sister Heather professed her solemn vows in June of this year. She now lives the life of mercy not just in her monastic community but also in her job as director of social services at the sisters’ St. Paul Hermitage. The facility serves the elderly by providing independent living, assisted living and 24-hour nursing care. While Sister Heather considers it a gift to have a job in which she is able to show mercy, she says that mercy “doesn’t necessarily have to be big acts. “My definition of mercy is living a life of love and compassion. It’s those little things we do over time, like thanking a co-worker, or letting someone going through a hard time know I’m praying for them.